I have added 6 blocks (145 x 30 pixels) for interested advertisers. The monies earned from these advertising will be added to my childrens’ education fund as I am not able to pay for their study in the near future. Instead of just requesting for donation, I was thinking why not I put up some blocks for interested parties to advertise their sites, products or services. I will only maintain these 6 advertising blocks and definately no plan to increase the bumber of blocks. My wife and twin babies have finally discharged from hospital. 3 of them are healthy. All this while in my lessons, I use “ou” for word that represents the long sound. Example : Kinou should be read as Ki No- where the “No-” will be read a bit longer instead of reading it as Ki No U. In Hiragana, it is written as “きのう” (Kinou). That’s why some people here may confuse whether to read it as “Ki No-” or “Ki No U”. In Japan, the romaji they use to identify this type of pronunciation is “ō” which means there’s an “U” at the end of the “O”. This will tell you that you have to read it as “Ki No-” instead of “Ki No U”. Previously, I did not use “ō” because I didn’t know that this character existed in the font until today, I finally found this character in the font. So all future lessons related to longer sound that use “ou”, i will put them as “ō”. For example : In hiragana, Tokyo is written as Toukyou which many people don’t even know what is this. So I will use Tōkyō which means you have to read it as To-kyo-. If anyone having difficulty with this character, please let me know. My wife just gave birth (caesarian) to a twin baby girl. Twins in Japanese is “Futago” as this will be today’s lesson :D. There won’t be any lesson in this 2 days as I have to accompany my wife for at least 2 days at the hospital. Hopefully my wife can be discharged on this Sunday. Now I have started to confuse who’s the elder and who’s the younger (1 minute different) as they looked the same. I need to refer to the tag to identify them by looking at the title, “Twin 1″ & “Twin 2″. Many people told me that after a month or so, I will get use to it and can easily identify the difference. Happy Prosperous Chinese New Year To All. 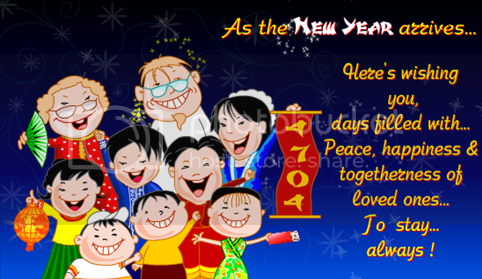 I will be off for Chinese New Year from today until 4th Feb 2006. I’ll be going off for my Christmas Holiday with family for 3 days. From tomorrow, I will start off from Basic Japanese until Advance Stage. If you follow through everyday, you will most probably be able to master your japanese language. But before we proceed with tomorrow lesson, you must first study hard on the pronunciation that I have posted earlier. You do not need to learn about the hiragana & katakana writting where I will use “romaji” in all lesson here. Of course, if you are interesting in learning the hiragana & katakana, you can do so ;).